We are a local chapter of the Goldwing Road Riders Association. "The Motorcickle Capital of the World!" We like safe riding and promote having fun. We meet on the first Tuesday of the month in Winder, Georgia at the Golden Corral. We eat beginning at 6:00 pm and begin our meeting at 7:00 pm. Golden Corral is located at 163 East May Street, Winder Georgia 30680. We hope to see you at one of our upcoming gatherings and/or rides! We are Janel and Joe Piper. We proudly serve as Chapter Directors for Georgia Chapter S. Our Chapter was chartered in 1990 and has continually succesfully operated since that time. 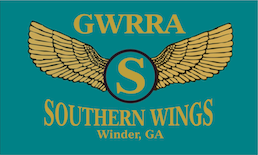 As Chapter Directors, along with our fine TEAM, we strive to provide our GWRRA members with varied and FUN riding and social activities. Though we are an organization primarily comprised of Goldwing riders, we welcome all motorcyclists, regardless of the make or model you may ride. It is our sincere hope that you will join us at one of our gatherings or rides to check us out. Our primary focus is to have FUN. That said, we make every attempt to do this in a manner to ensure our safety, as well as the safety of all others on the road. So, whether you are new to riding... or if you've been riding for many years. Please come meet us and see what GWRRA and Chapter S are all about. Also, please feel welcome to contact us, or any of our TEAM. Our contact information can be found on our "TEAM" page. Numerous rides and events have been added to our Events Page. Our "Major" April, May, and June Chapter Rides have been added to our Events Page. Our April Newsletter has been added to our Newsletters Page. A "Photo Ride" for Saturday, March 16, 2019 has been added to our Events Page. A "Retiree Lunch Ride" has been added to our Events Page. Our March Newsletter has been added to our Newsletters Page.